Appearing twice in the St. Lawrence Starch Company’s landmark Group II Beehive hockey picture promotion – as a Maple Leaf in one, Black Hawk in the other – Tod Sloan’s image was also available as a premium, with a syrup can cap liner that was issued sometime during the 1950s. We have an example that comes directly from the Sloan family, with this particular cap liner the only specimen we have ever seen! 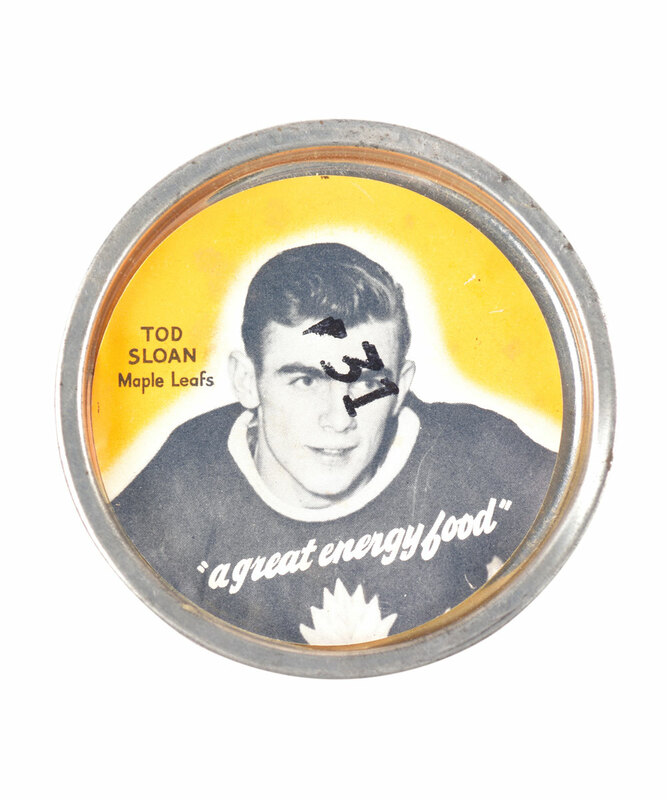 Extremely rare with known examples extant featuring Maurice Richard and Ted Kennedy, the 3” liner remains completely affixed to the lid, with “31” in dark ink stamped over a portion of Sloan’s face. With just a few surface wrinkles and light wear to the cap, this scarce premium will be accompanied by an LOA from the Sloan family.